A centrifuge is a device that uses centrifugal force to separate two or more substances of different density or mass from each other. Centrifugal force is the tendency of an object traveling around a central point to fly away from that point in a straight line. A centrifuge is able to separate different substances from each other because materials with heavier masses move faster and farther away from the central point than materials with lighter masses. The first successful centrifuge was invented in 1883 by Swiss engineer Carl de Laval. A centrifuge consists of a fixed base and center stem to which arms or holders containing hollow tubes are attached. When the device is turned on, the arms spin around the center stem at a high rate of speed. In the process, the heavier material is thrown outward within the tube while the lighter material stays near the center of the device. Large-scale centrifugation has found a great variety of commercial and industrial uses. For example, the separation of cream from whole milk has been accomplished by this process for more than a century. Today, the food, chemical, and mineral industries use centrifuges to separate water from all sorts of solids. Medical laboratories use centrifuges to separate plasma from heavier blood cells. Modern centrifuges can even separate mixtures of different sized molecules or microscopic particles such as parts of cells. These instruments, called ultracentrifuges, spin so fast that the centrifugal force created can be more than one-half million times greater than the force of gravity. Centrifuge studies have been very important in the development of manned space flight programs. Human volunteers are placed into very large centrifuges and then spun at high speeds. Inside the centrifuge, humans feel intense gravitational forces (g forces) similar to those that occur during the launch of space vehicles. Such experiments help space scientists understand the limits of acceleration that humans can endure in such situations. Thank-you for generating such a straighforward, informative and step-by-step description of centrifugation. Desperately, I searched virtually everywhere until I could find a general/methodical/step-by-step process of centrifugation. Moreoever, you have helped me in my year eleven Chemistry studies which I appreciate. IT AES REALLY EDUCATIVE.IT HELPED ME A LOT FOR MY SAMINAR WHICH IS GOING TO BE HEID ON 10/08/2011. i started the RC6 centrifuge at 18,000 rpm 4oC for 45 min after balancing & tightening the lid properly. i started the centrifuge & waited there till speed got stabilized to 18,000pm. the centrifuge ran for 35 min & in between rotor came out of the shaft damaging the rotor & shaft . 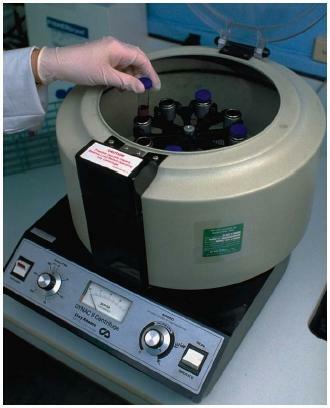 I would like to know the benefits of using a centrifuge in the medical industry? i have an important question that I cannot find the answer to. now centrifugation is used to separate liquids or insoluble solids from liquids it but can solid-solid mixtures be separated using centrifugation ? also what mixtures cannot be separated using centrifugation? please answer asap.